Still time to comment on plans for the Haw River State Park. Relevant documents here, here, here, and here (PDF). Comment here, or via email. The N&O's series on the Mountains to Sea trail reaches the Triad. Tourism dollars are invoked. The trail could link our proposed downtown greenway with the watershed trails and leverage the Haw River State Park. Kind of like an internet for your feet. John Young gives a little background on the Guilford County Open Space Committee, and concludes with this gem about a current project: "If approved the state funded Mountains-to-Sea Trail should connect through this area and eventually allow hiking from downtown Greensboro to the Haw River State Park." With the economy in a lull, this would seem to be an excellent time to secure as much land as possible at reasonable prices. If Guilford booms in the next upswing, open space will be all the harder to find. This site has info and links on the MST. A celebration of the big addition to Haw River State Park, Tuesday, March 4, at 5pm, Summit Environment Education Center. Dignitaries in attendance. Worth going anyway. "The Council of State in Raleigh approved yesterday the acquisition of the 692 acres adjacent to Haw River State Park we worked to hard to protect. "Closing on the property should happen by the end of this month. "We anticipate there being a ceremony of some sort in March to celebrate this great achievement." Meanwhile, REI has donated eight canoes to the park. My newspaper column is about the broad-based, tech-adept coalition that won a big conservation battle to allow the expansion of the Haw River State Park, and the possible emergence of a new force in local politics. "The idea that excites me is not opposition to growth, but smart growth, green growth, a sense that Greensboro and Guilford can and should be the most livable metropolitan areas in the state." A key quote: "The Internet has changed the way the neighborhoods can organize themselves and present their case," says City Councilman Robbie Perkins, himself a prominent developer. "Politicians are listening to these groups. They are listening to the blogs." "A Florida development company is dropping its plan to build a golf-course community next to Haw River State Park and will sell the land to North Carolina's state park system for $14 million." Taft Wireback breaks the news. "[County commission chair Kirk] Perkins said public sentiment was overwhelmingly against Bluegreen's proposal and it was good to see the project conclude in a way that appeared to be good for all sides." Thanks to our hard-working neighbors for their efforts on our behalf. Spent most of the last day of 2007 outdoors. The much-needed rain had the Haw running high through some bottomland just downstream from the Haw River State Park. 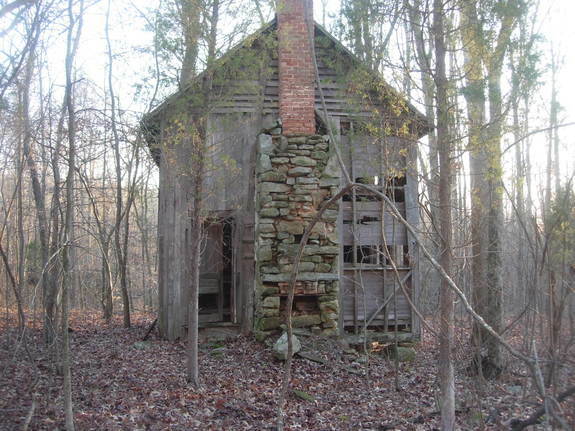 This abandoned farmhouse is near the Haw in Rockingham County. Another delay for the Haw River Park hearing. Not necessarily bad news for park supporters, but not a sign to ease up, either. Jim Belk, chairman of the Greensboro Area Convention & Visitors Bureau, writes to Guilford County commission chair Paul Gibson in support of the Haw River State Park. Marci Brown, CEO of the Tarheel Triad Council of the Girl Scouts, does, too. Yesterday: a body blow to the development plan. From a letter to the NC Department of Environment and Natural Resources from Pat Danahy, CEO of the Greensboro Partnership. It has come to our attention that Bluegreen Corporation of Florida is planning to develop a 692 acre golf community (Patriots Landing Private Golf Course and Gated Community) on land proposed for the expansion of the Haw River State Park. The planned location of this development will be detrimental to the full development of the state park and therefore the economic growth and development of Greensboro and Guilford County. When a group that bills itself with some credibility as "the principal economic and community development organization in Greensboro" opens up with that kind of broadside, it would seem likely to sink any economic development arguments planned by backers of the project. Well, any such arguments that might have survived the housing bubble and the drought. Anyone know anything about that upcoming meeting in Atlanta? I hear there's a big meeting coming up December 6 in Atlanta between principals in the Haw River Park land deal. This would be an excellent time for proponents of the park to encourage the state to get the deal done. Rally for the Haw River State Park, Saturday, December 1, 2007, 1:00 pm to 4:00 pm. You want food, music, and guided tours of the Haw River wetlands? You got 'em. Donations of any amount appreciated, but cannot be accepted on park property -- mail to Kyle Klimek, 6112 Church Street, Greensboro, NC 27455. RSVP to HawRiverSP@gmail.com by November 30. And don't forget the hearing before the Guilford County commissioners, 5:30 pm December 13 at the old County courthouse. Has there ever been a more one-sided public discussion in Guilford County than the Haw River park vs gated community issue? The letters in favor of the park and against the proposed development keep coming, but even obvious astroturf support for the project seems to be lacking. I wonder if the County Commissioners are keeping score. Pictures from the Haw River pumping station. Wait... are they saying that if GSO's use of an emergency reservoir on the Haw is contingent on a specific rate of flow being maintained along the river, then sucking water out of the river to keep a private golf course green might not be the wisest choice to make? The city's use of the Haw could figure in a prominent rezoning case pending before the Guilford County Board of Commissioners. Florida-based developer Bluegreen Corp. hopes to build a gated, golf course community upstream from the city's dam, near Haw River State Park. Bluegreen plans to pull water from the Haw for several years, to irrigate its new fairways and greens. If the case comes to a hearing before the board as scheduled next month, the Haw's role as Greensboro's safety valve likely will be mentioned by project opponents, said David Craft of Citizens for Haw River State Park, a nonprofit group opposing the Bluegreen project. "It wouldn't be a huge withdrawal. But it's one they could make at anytime, even in the midst of a drought," Craft said. If only there was an easy way to contact our County commissioners about this issue! The Haw River Assembly will hold its 25th Annual Meeting at the Summit Lodge in the Haw River State Park, Sunday, November 4, 2007, from 12 to 5 pm. Keynote speaker is Secretary Bill Ross of the N.C. Department of Environment and Natural Resources. $10 contribution per person (children are free) includes lunch and snacks. RSVP to HRA, P.O. Box 187, Bynum, NC 27228. Contact HRA at info@hawriver.org or (919) 542-5790. Citizens for Haw River State Park: "The very generous offer for the approximate 692 acres made to Bluegreen by the N.C. Depart. of Environment and Natural Resources, Division of Parks and Recreation has not yet been accepted." More: "It appears at this time Bluegreen still thinks that it has a chance to have both the Guilford County Commissioners and the Rockingham County Commissioners approve their rezoning request. "Keep those phone calls, emails and letters coming! We cannot let down our guard!" More info, including ways to respond, here. Archive of related posts here. NYT: "These last-minute measures belie a history of inaction in Georgia and across the South when it comes to managing and conserving water, even in the face of rapid growth. Between 1990 and 2000, water use in Georgia increased 30 percent. But the state has not yet come up with an estimate of how much water is available during periods of normal rainfall, much less a plan to handle the worst-case event — dry faucets." Fortunately our local officials in Guilford County would never approve a project that ignores the realities of water usage...right? As Guilford County ponders the fate of the Haw River State Park, I wonder will happen to the huge (1,750 acre) Richardson tract to the southwest, off Plainfield Road between Lake Brandt Rd and Church St. (map of property corrected and approximate). Greensboro's emergency water supply is a pool in the Haw River that we can tap only if a certain rate of downstream flow is maintained. So how can the Guilford County commissioners consider approving a development project that would pull substantial amounts of water from the Haw each day to keep a private golf course green? Especially when there's such an excellent alternative. BizJournal says the state has made a bid on the contested acreage for Haw River Park. The offer reportedly reflects the high-dollar, rezoned value of the land. I hope the property owners Bluegreen Corp. takes it. Judging by the public response, the alternative development plan (gated community and private golf course) is in serious trouble. Meanwhile, I keep hearing from people who are interested in adding other adjacent tracts to the park. The bigger, the better. 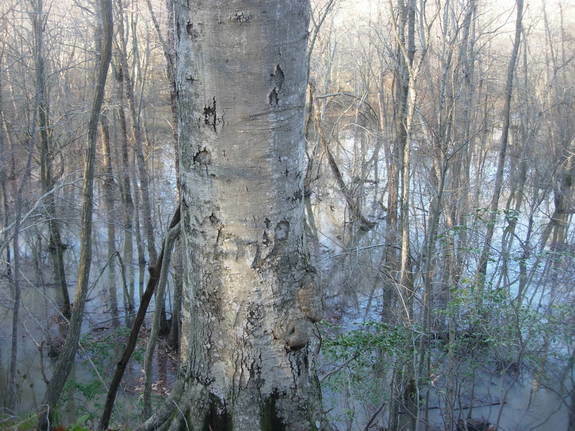 As Jack Jezorek points out, this isn't about protecting a narrow riverine strip, but "a broad expanse of flat, wet land...the Haw River and its wetland flood-plain...large expanses of woodlands still exist...the last vestige of an unspoiled river corridor." N&O: "Voters in Wake County's two largest cities sent a strong message Tuesday by electing a slate of candidates who campaigned on either slowing growth or requiring more of developers." Pearce on the request for public funding of a parking deck that may have sparked the anti-developer revolt: "You almost never get 80 percent on a contested issue in politics. When you do, you run with it." Could the campaign to save the Haw River Park spark a similar movement in Guilford and Greensboro? Plead the First has a cartoon and some commentary about the choice between a healthy Haw River Park and a gated community with a private golf course. More here, including info on obtaining yard signs and contacting elected officials. Index of my posts and links on the subject here. Momentum is clearly with proponents of the park. This is no time to let up. Greensboro residents stand up to developers, head off ill-advised rezoning proposal. Let's hope the County commissioners catch the vibe. Applied Rationality: "The proposed Bluegreen development along the Haw River certainly makes sense to the Bluegreen Corporation and the current property owners but doesn't make sense to the rest of us." The current property owners might do OK in a deal with the State, too. Unscientific but interesting: the one-sidedness of the public conversation (letters to the editor, blog posts and comments) on this issue. Hard to find a supporter of the development in the mix. Also: Guilford commissioners' Chairman Paul Gibson said he has received more correspondence from residents about Patriot's Landing than any other in his seven years on the board. "Ninety-nine percent of what I'm hearing is, 'Don't rezone it for a golf course,' " he said. The people of Guilford and Rockingham counties want a park along the Haw instead of a gated community and private golf course. Reidsville Mayor James Festerman writes the county commissioners of Rockingham and Guilford to express "strong opposition" to the rezoning and development of property along the Haw River (click here to see a PDF of both letters). From the missive to Guilford CC chair Paul Gibson: ""The Haw River State Park holds a great deal of promise...Anything that negatively impacts both the present State Park and the possibility of its expansion cannot be good for Rockingham County, Redisville or northern Guilford County." Pulling 100K gallons/day from the river in order to water a private golf course, he says, "could have a devastating and costly effect on Reidsville's wastewater treatment plant operations." Meanwhile, Guilford County has granted developer Bluegreen Corp's request for a delay in hearing the rezoning question. The State of NC will be allowed to do a full appraisal of the land. The delay is disappointing, but the momentum is in the right direction. Still, this is no time to ease up -- let your elected representatives know what you think about the issue. Justin Catanoso covers the Haw River State Park story. What is the true market value of land when its development is contingent on zoning? If the rezoning is not approved (i.e., the appeal is successful), then what is the property in question worth? Is it the job of Guilford County to maximize the payout to the landowners, whatever other issues may be involved? I love these quotes from County commissioners: "Trees and open space don't do much for me," Alston says, "but I've got to respect other people's views on this." Adds Yow: "My history is to go with the developer -- but not always." Is Alston still a business partner of Bluegreen attorney Henry Isaacson? I've gotten a lot of positive feedback on my column about the Haw River Park. Some people want to know what they can do to help. CHRSP has some suggestions here -- scroll down for contact info for County commissioners. While the rezoning appeal should succeed on its merits, supporters of the park might also urge the State (contact info here) to get its act together in an expeditious fashion. A question about the alternative plan to Bluegreen's development along the Haw: Is there one? Is there a firm plan to purchase all of the land in question, and to protect the financial interests of the people who contracted to sell to Bluegreen? This thing should be a win-win, and it would help to have a firm commitment from the State beyond its statement of interest and ability. The people of Guilford County have a choice: We can add to the nascent Haw River State Park along our northern border or allow instead the development of a gated community and exclusive golf course on land that could be part of the park. My newspaper column is about the choice facing the Guilford County commissioners, and through them the people of Guilford. You can read the whole thing after the jump, and attend an open house at the park's Summit Environmental Center this afternoon from 1-4. More from Eric Schaefer on the Outdoors page of the N&R sports section: "How badly we want this park, what are we willing to sacrifice, and how extensive and inclusive it needs to be are questions we ought to be asking now, since we have only one chance. Once the land is developed there will be no returning." Citizens for Haw River State Park blog: "If the Guilford and Rockingham County Commissioners allow the rezoning for Patriot's Landing both counties will be again ignoring the major concerns of the N.C. Division of Water Quality and may be directly forcing the creation of new, stricter, more expensive water quality rules and regulations for the Haw River/Upper Cape Fear River Basin watershed." So...we wouldn't just be trading parkland for McMansions and a private golf course, we'd also contribute to water-quality problems downstream and perhaps bring onerous regulations on ourself in the process? Awesome. CHRSP website has info on Sunday's open house at the Summit Center. Citizens for Haw River Park will host a community meeting tomorrow from 5-7 PM at Gethsemane United Methodist Church, on the corner of Church St. and Highway 150. From the blog: "There will be opportunities for you to learn more about the Haw River State Park, let your County Commissioners know how you feel, and find out what we're doing to stop the rezoning. Plus there will be cookies and lemonade!" Reidsville Review covers the Haw River Park controversy (thanks to JS for the pointer). Rockingham County would get "minimal" tax revenue from the project, says County Manager Tom Robinson. Yet a sewage plant for the gated community would be in Rockingham. Sweet deal! Our neighbors to the north seem likely to delay their decision on the development until after Guilford County commissioners consider an appeal on October 18. Speaking of which, is GC commissioner Skip Alston still a business partner of developer attorney Henry Isaacson? Guilford County Manager David McNeil said he has not made a formal recommendation for county commissioners, but he spoke positively about the development plans. "I'm very familiar with the property, and it seems like a very good development as planned," he said. Future generations will applaud our efforts to see the Haw River State Park develop into its full potential. I cannot see anyone saying that about the development proposed by Bluegreen. The choice is clear: Do we support a private and gated golf course community, or a fully developed Haw River State Park? More at the Citzens for Haw River State Park blog, which could use a link to the group's website, and maybe some of the nice pictures on display there, too. Citizens for Haw River State Park: "The Haw River Trail Memorandum of Understanding, signed by the Guilford County Board of Commissioners (April 10, 2006) and Rockingham County Board of Commissioners (March 16, 2006) prohibits wastewater treatment plants or development within 500 feet of the Haw River." How close would the proposed Patriot's Landing development come to the river? Discharge data for the Haw River, from which developers plan to divert large amounts of water for a new golf course -- unless the land is attached to the Haw River State Park instead. Thanks to Jeff Sykes for the pointer -- he promises to have more info up at his site, soon. A map of the area where we can choose between a proposed gated community and golf course or a state park. The blue marker on the left shows the approximate location of the proposed development, the blue marker at right the Summit Environment Center at Haw River State Park. Look at the amount of green space already devoured in that neighborhood, and tell me we don't need to save all that we can of what's left. Another map shows the area up close. A map to put things in geographical context. Haw River Assembly seems to concern itself mostly with issues downstream from Guilford and Rockingham, but the group has noticed in the past the "beautiful Piedmont bottomland forests and wetlands" of the park, and of course what happens up here has consequences along the riverine path. Citiizens for Haw River State Park has a blog to go along with its website. I'd post a picture a day, and get some video up, too, in addition to news updates. Let people see what's at stake here. And I'd put up a blogroll with links to the group's website and other resources. David Craft has a letter about the Haw River Park in this morning's N&R. Kicker: "Do the citizens of Guilford and Rockingham counties want Haw River State Park or a private gated golf course? Please tell the commissioners how you feel." Save the park website. Previously, previously. Just spoke to David Craft, one of the co-chairs of Citizens for Haw River State Park. These guys are serious about preserving a nice chunk of North Carolina, and they may have the money and political skills to pull it off. On Aug. 8, the Guilford County Planning Board approved a rezoning request by Bluegreen Corp., based in Boca Raton, Fla., to develop approximately 691 acres along the banks of the Haw River. The proposed development will comprise 775 housing units in a gated golf course community. Lewis Ledford, director of the state Parks and Recreation division, has endorsed the appeal of the zoning decision. The volunteer group has an action plan for grassroots supporters. I spoke with David Craft about beefing up the web component of that effort, and I hope we'll see some results in the very near future. 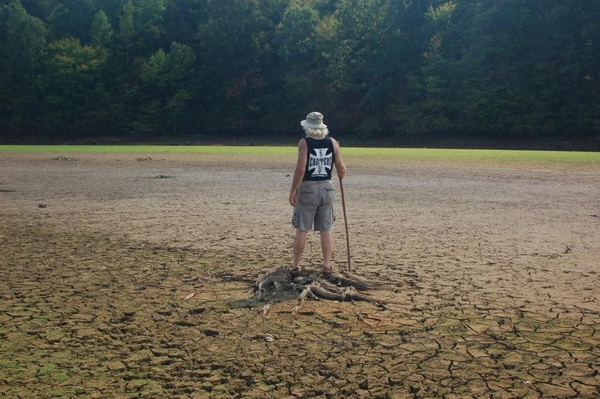 "Click to read our Action Alert, then tell YOUR County Commissioners that the lands near our Haw River State Park are more important than a golf course to the Citizens of Guilford and Rockingham Counties!" If anyone's got a digital copy of the related op-ed in this morning's N&R, send it along. UPDATE: Ask and ye shall receive: here's the article by John Young. The old springhouse mentioned in this column is quite near the proposed development. As I wrote then about another big project perpetrated in my youth, "It was the first time I would see Greensboro devour its landscape on a grand scale, and despite prolonged and repeated exposure to the phenomenon since then I've not quite gotten used to it."